Amid fears of a shortage of people, Burgundy dined alone until he was joined by Green who (unusually) also ordered some food. While discussing likely numbers Pine appeared, shortly followed by Green’s food and then Ivory. Once Burgundy had finished his meal he joined Pine and Ivory in a short game of Love Letter. This is the archetypal micro game where players draw a card to give them a hand of two and then choose which one to play, with the aim of knocking everyone else out and/or being the last player remaining or the one with the highest card. 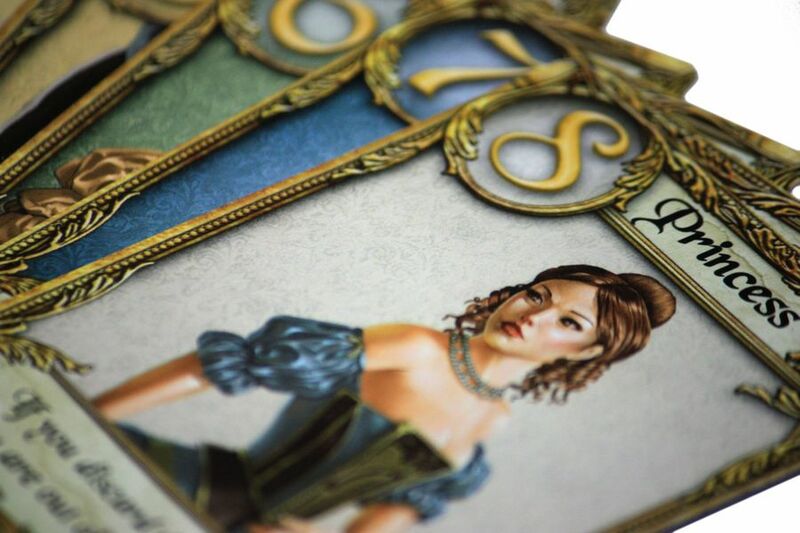 With only sixteen cards in the deck and each round taking only a couple of minutes, it provides an excellent little filler that can be stopped at almost any time. In the first round Pine was knocked out early, but Ivory caught Burgundy holding the Princess. In the second round, Burgundy was knocked out early leaving Pine and Ivory to try to outwit each other. It all went to pot for Ivory though when he got confused as to which cards were played and thought he had to reveal his hand showing everyone that that he had been caught with the Princess. He didn’t have to discard his hand, but what’s been seen, can’t be unseen, so when Pine drew a Guard, it was inevitable that he would “guess” correctly that Ivory had the Princess. There was just time for one last round (which Pine won) before Green disposed of his empty platter and Black and Purple arrived. So Love Letter ended with Pine the winner. 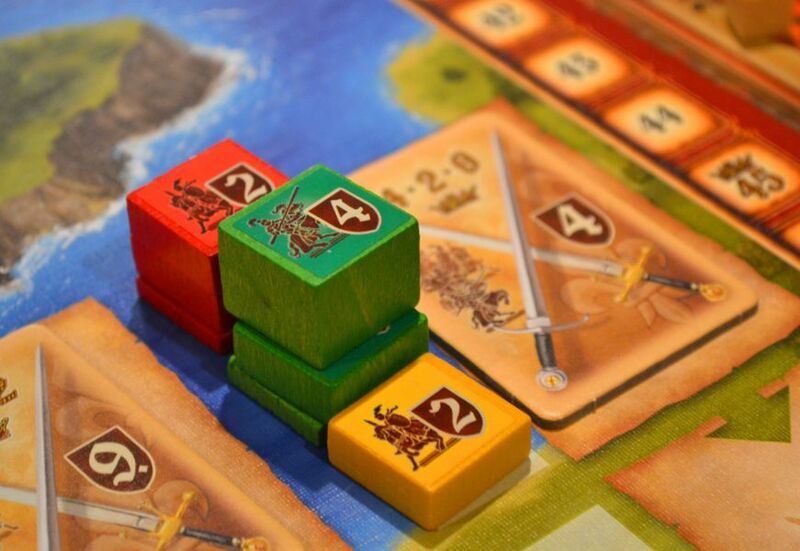 With six players and the “Feature Game”, Lancaster, playing a maximum of five, the group split into two, with Ivory and Burgundy joining Green for a little medieval fun. Although Burgundy and Green had played it quite a lot over the last two and a half years, Ivory was new to the game so rules run-down was needed. 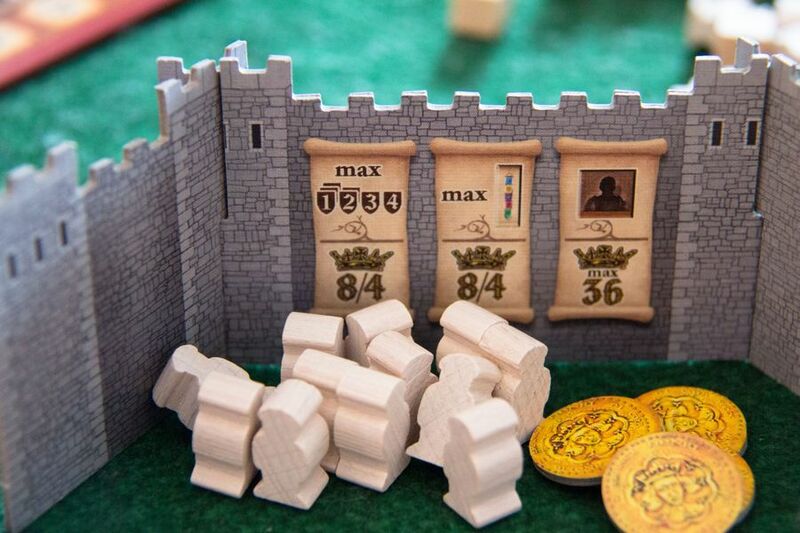 The idea is that players take it in turns to place their knights in one of three places: in the shires; in their castle, or in the wars in France. Once the knights have been placed, players then vote on and evaluate “the Laws” which give players a benefit just before they get their their rewards for knight placement. After five rounds, the player with the most points wins. Once the game was set up and rules explanation was over, we started – the first time we have played it with three, and it did play slightly differently. With only two Nobles per County it was going to be a real scrap to get them. Ivory went for a castle improvement strategy, Green tried to bag those few Nobles and Burgundy went for conflicts in France. Overall there was not a huge amount of conflict in the counties with so few players. In round one Green ended up with two upgrades and took his level two Knight straight to level four which gave him access to higher level counties that were out of the reach of the other two. This helped him gain the nobles he wanted, but in the next round he sent the valuable level four Knight off to the wars in France, to help in a level seven & eight conflict that needed the firepower. There still wasn’t much conflict in the Shires, except for one where Burgundy knocked Ivory’s level one Knight out with another level one Knight and a squire. Ivory just accepted it and went elsewhere. There was a little more conflict during rounds three and four, but not much. Again it was Burgundy picking on Ivory, although Ivory put up more of a fight this time. Green did not make effective use of his voting influence and Burgundy was becoming a threat. By regularly taking the ‘free’ Noble bonus when entering conflict in France, he had started to catch Green in the total number of Nobles. Finally, in round there more conflict, though still not as much as we usually get in four and five player games. Every one had managed to increase the number and value of their Knights. Ivory had also managed to gain three castle improvements and no longer needed to place any Knights there. Burgundy and Ivory entered into a savage battle over a level four County which would give the victor the chance to gain two nobles, and lost several squires in the process. It didn’t stop there either as they fought over a couple of other counties that seemed a good benefit in this final round. Just when it all seemed settled with Ivory coming out on top, Green placed his last Knight with a whole bunch of squires in the level four county. Neither Burgundy nor Ivory had the “squire-power” remaining to dislodge him, so instead they entered into a new round of conflict in other Counties. In the end we realised that all the current Laws would benefit everyone all equally, and the new ones were not much help either, but we voted anyway. When it came to dishing out the rewards, both Burgundy and Green realised they had made a mistake, forgetting that they wouldn’t get the Knight upgrades they needed for the reward until after reward had been evaluated. Not that it made a huge difference as the scores were all quite well spaced already. During the reward taking in the counties Ivory realised he had taken both Nobles from one county, which was against the rules (all nobles must be from different counties). There wasn’t a lot that could be done, but he insisted on putting it back and so the others suggested he take back his three coins as well. Burgundy did point out that he and Green may have done something different as they had both wanted this one too. These things happen sometimes though, and it is “only a game” after all. 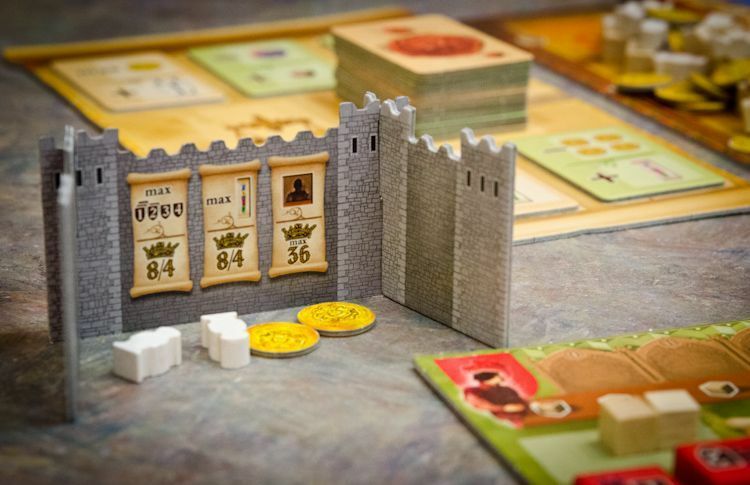 In final scoring Ivory won the points for the most improved castle, Green won the points for the most powerful Knights, and Burgundy and Green both had one more Noble than Ivory (who had grabbed a load in that final round). Packing up, we discovered that three of the laws had been left in the bags (one of each of two, three & four class). We had commented how we had seem to get to the last round quickly, and now a check of the rules showed that we should not have taken any laws out and it should have gone on for another round. The scores were pretty comprehensive though with Green nearly ten points clear of Ivory in second place. But Ivory had enjoyed it though, so it will no doubt we’ll play it again in the not too distant future. Meanwhile, on the next table, Pine, Black and Purple were playing Calimala. This got an outing only a few weeks back, but Black and Purple have played it quite a bit since Yellow introduced it to them a six months ago at Didcot Games Club. 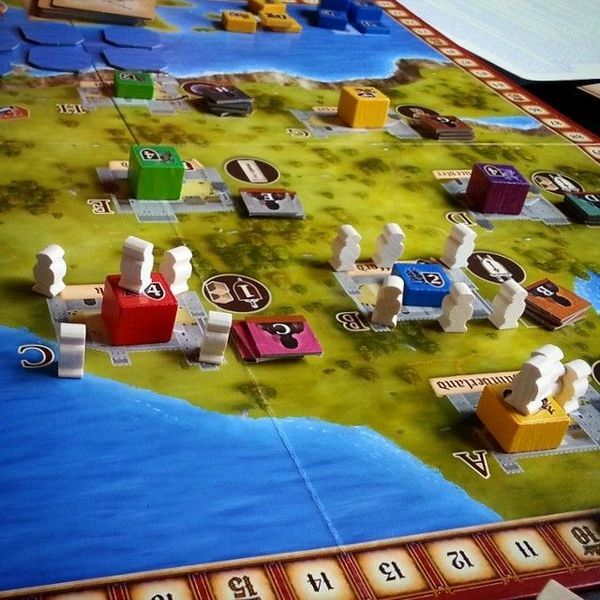 Calimala is an area-influence driven, worker-placement game set in the Republic of Florence during the Late Middle Ages. The action is all centred round the unusual action board, where place one of their workers on one of the twelve worker spaces. Each one of these is adjacent to two of the nine action spaces and the active player gets to carry out both actions. If there is already a worker disk present on the space when a disk is added, the owner of the other disk gets another turn. This continues until a player places the fourth disk on a stack which triggers scoring. In addition to worker disks of their own colour, each player also gets a small number of white disks: coloured disks give players a maximum of two actions on three occasions (i.e. 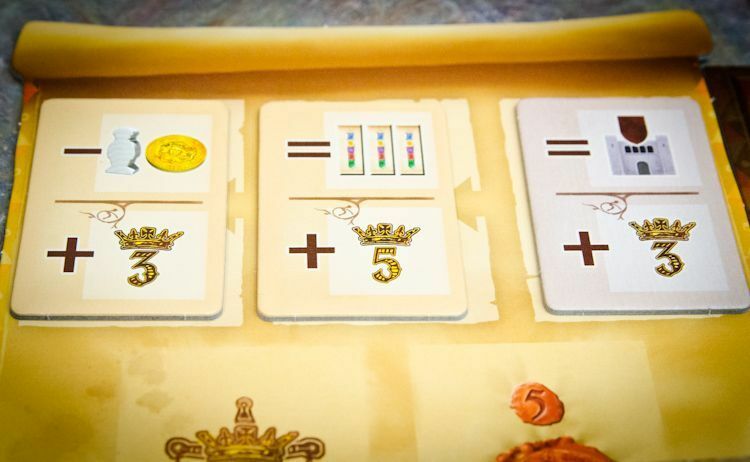 a total of six), while white disks give four actions when played, but none later in the game. 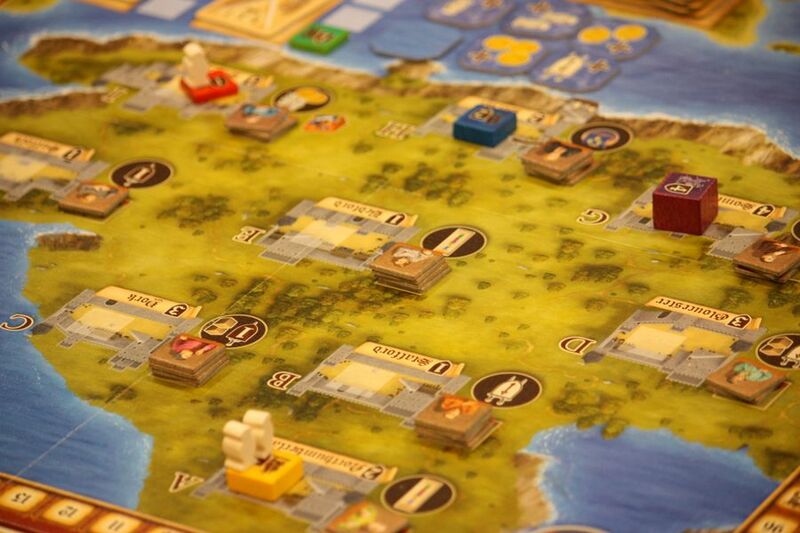 The fifteen scoring phases are built on the actions, rewarding players for the amount of cloth they have shipped to a given city or combination of cities for example, or for their contribution to a specific building, or their contribution to the building effort of a given resource. In each case, the player with the most scores three points, the player in second place scores two and the player in third gets just one point. In case of a tie there is a complicated series of tie-breakers. The game ends when either all fifteen tiles have been scored, or everyone has placed all their workers (in which case any remain tiles are scored). This time Pine led the way in points, pretty much from the start. He managed to give the impression that he had no idea what was going on though, as he kept asking questions. It was really close at the end, however. Black had the Barcelona scoring card, Purple had Troyes and Pine got close to the Lord, with the Cathedral of Santa Maria del Fiore. It was all largely academic in the end though; as is often the case in this game, there were lots and lots of tie breaks when scoring the districts. Gradually, as Black kept winning the tie-breaks, he began to catch up with Pine. The question was, would he make it? He did, just, beating Pine into second place by a measly three points. Learning Outcome: Nobody is indispensable. This entry was posted in Games Night and tagged Calimala, Lancaster, Love Letter on September 4, 2018 by nannyGOAT.